Have you thought about how you and your family will survive the next major bushfire in Brogo? Major bushfires are not frequent events but when they do occur they can have a devastating impact, as was seen with the Victorian Black Saturday bushfires on 7 February 2009. On average, the Bega Valley has about 60 bushfires each year and 3 to 4 of these are considered significant. Major fires which burnt over 1000 ha resulting in loss of life property or economic value occurred in 1906, 1926, 1939, 1942, 1952, 1972, 1980, 1985, and 1988. These fires are often driven by hot westerly winds followed by strong southerly wind changes similar to what we saw in Victoria in 2009. Not all bushfires are the same. Their intensity is greatly increased by strong winds, low humidity and high temperatures as well as the available fuel, especially the finer fuels that are generally less than the thickness of a pencil. Fires burning in the early morning or night may be easily managed while the same fire in the early to mid afternoon can burn with devastating intensity with a rate of spread that can be measured in many kilometres per hour. The Bega Valley Bush Fire Risk Management Plan, a copy of which can be viewed here (PDF, 29.0 MB), currently rates the residential areas of Brogo as having a very high fire danger risk. So while serious bushfires are not frequent in Brogo, they are so potentially dangerous and stressful it is a wise move to ensure you have a well thought through survival plan. By far the safest option for surviving a bushfire is not to be there and for this reason the Rural Fire Service strongly recommends that you relocate to a safer area hours, or the day before, days when the fire danger rating is Catastrophic. Unless you and your property are very well prepared as similar recommendation is made for days of Extreme fire danger rating. 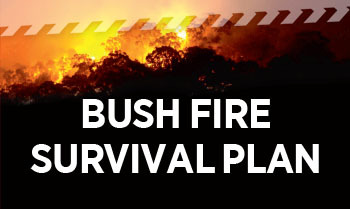 To assist you in developing your survival plan, the Rural Fire Service has prepared a Bush Fire Survival Plan Document which can be either downloaded here or obtained from Bega Fire Control in Maher St, Bega.